This is a axial type 1/4 watt 1 milli-Henry (1000uh) Inductor with 10% tolerance. 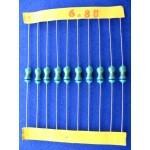 6.8uH InductorThis is a axial type 1/4 watt 6.8 micro-Henry (uh) Inductor with 10% tolerance. ..